We just returned from our four day birding adventure to the Pelee area with our friends, Jim & Lynda. On our way down we decided to stop into Rondeau Provincial Park, as none of us had been there before, and we heard the birding is excellent there too. We had also heard through the birding grapevine, that a gentleman who lived in one of the many homes in the park was having a rare to the area, Yellow-throated Warbler visit a feeder on his property and was welcoming birders to come and see it. This bird is normally not seen on this side of Lake Erie and was causing lots of excitement in the birding community. It's not too often that strangers open the kindness gates like that. When you have a passion for birds and birding, an opportunity to see a bird like that is a gift, and he was giving that gift to everyone who wanted to see it. We were given directions to the cottage from a couple we met while on a trail in the park, and decided to visit the home after our walk. It wasn't a hard cottage to find, the many birders with cameras waiting on the lawn was a sure give away, but so too was the sign he put at the beginning of the pathway up to his cottage with directions of where to walk, park and "welcome birders". While we were there Rob and I had two lifers, the Yellow-throated Warbler and a Red-headed Woodpecker. I know the warbler was causing all the excitement, but seeing the Red-headed Woodpecker took my breath away. 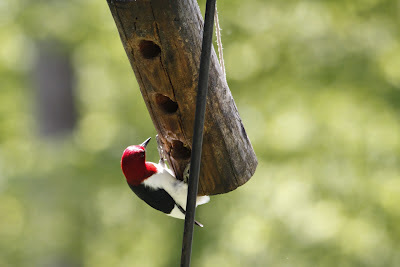 We stopped into the park again on the way home today, and did a couple more trails, and went back to the cottage, where we were treated to another sighting and song of the Yellow-throated Warbler, but the Red-headed Woodpecker didn't show this time. Thank you sir, from the bottom of my birding heart, for opening your yard like that to us and sharing your birding knowledge, it was appreciated more then you will ever know. 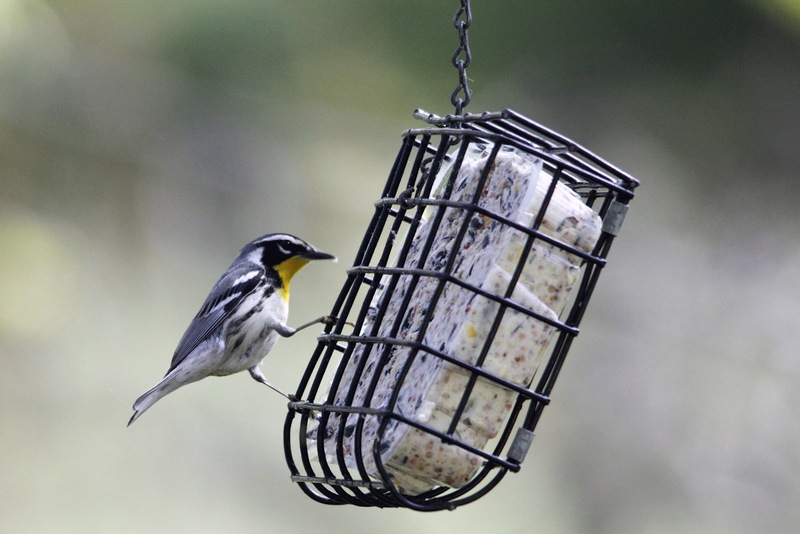 This Yellow-throated Warbler was causing lots of excitement. 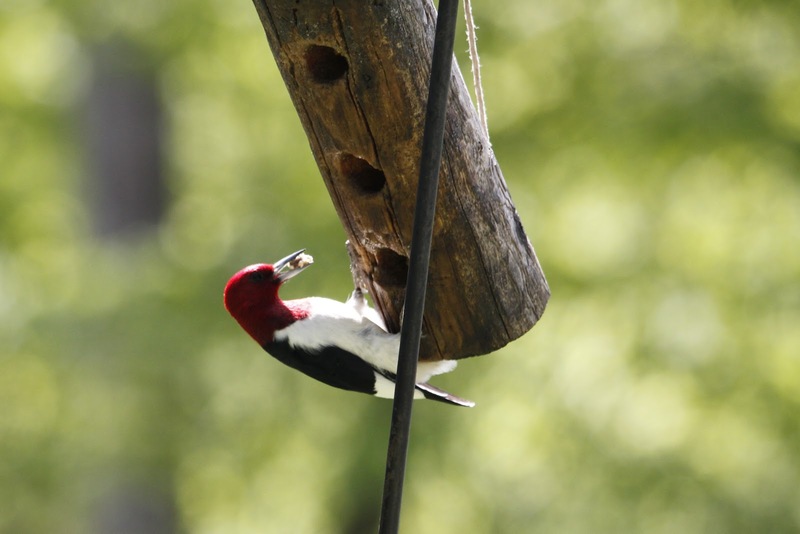 The Red-Headed Woodpecker getting a mouth fill of home made suet. More blogs to come about our trip, but I thought these two birds, and that one awesome gentleman deserved a blog of their own. You hit the nail dead on with your title and the subsequent write-up. Never seen either bird myself, but pleased you enjoyed the experience. I sure wished you'd consider dropping the 'word verification' workout. They've become so hard to read that I usually get them wrong. If I have to repeat myself I usually give up after the second attempt. Ric & Anne are a wonderful couple and I've had the pleasure of meeting them too. They are indeed very generous and welcoming pair.